“My dental crown came off when I was eating, what do I do?” Though it’s rare, dental caps or crowns may occasionally come off the tooth. If the crown does come off, it’s important to see your dentist right away, and may be considered an emergency dental visit especially if the tooth is sensitive or painful. What should I do when my crown came off? If your crown came off, the first recommendation is to have your family dentist evaluate the tooth and the crown to make sure both the tooth underneath the crown attaches to and the crown are in stable condition. 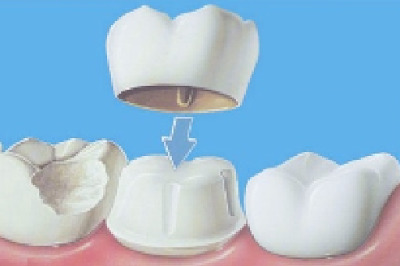 If both the tooth and the cap are stable, it may be a matter of just re-cementing the crown back on. If the tooth or crown is not stable, other treatment may be necessary. Nonetheless it is suggested one sees the dentist once the crown comes off as soon as possible to prevent further possible damage to the tooth the crown was attached to. The dentist will perform a limited exam and may take a couple of peri-apical digital x-rays to determine if there is damage or infection to the tooth. If you are on vacation or a business trip and are not able to have access to dental care and your dental crown came off, you can purchase temporary dental cement at a pharmacy to temporarily place the crown back on the tooth until you see a dentist. Alternatively you can also try Vaseline to create temporary seal between the tooth and the crown. If neither temporary dental cement nor Vaseline is obtainable, place the crown in a zip-lock bag and be sure bring the crown in for evaluation. What caused the crown to come off? Part of the tooth the crown adhered to has weakened from years of use, the tooth has broken off along with the crown. There was not quite enough ideal tooth structure remaining when the crown was placed (may have been due to extensive tooth decay or tooth fracture, and the crown was done to try and save the tooth from being extracted). The tooth was naturally short or small to begin with, and hence the crown may not have ideal sufficient tooth structure to hold the crown in place over sustained period of time. This is most common with second molars. Due to excessive use and chewing, the crown and along with a portion of the tooth underneath was “knocked” out. This may be prevalent in those who grind or clench their teeth. What are treatment options if my dental crown falls off? If the cement has weakened over time, the dentist in Bellevue may be able to re-cement the “old” crown back on with new dental cement. This is by far the most conservative and ideal outcome. If there is extensive decay or fractured tooth structure, the decay and weakened tooth portion may need to be removed and re-evaluated. If the decay is small, a re-cement of the crown is possible. A new crow may also be necessary if there is extensive damage. If the decay or fracture is extensive and the nerve is affected, a root canal and new crown, or even an extraction may be required if there is insufficient tooth structure for a crown to adhere to. If the dental crown fell off and it has been a few weeks or months since the crown has been off, this increases the chance the tooth may move and be subject to decay and fracture. If you have any questions or concerns about a crown that has fallen off, please consult your family dentist as soon as possible.